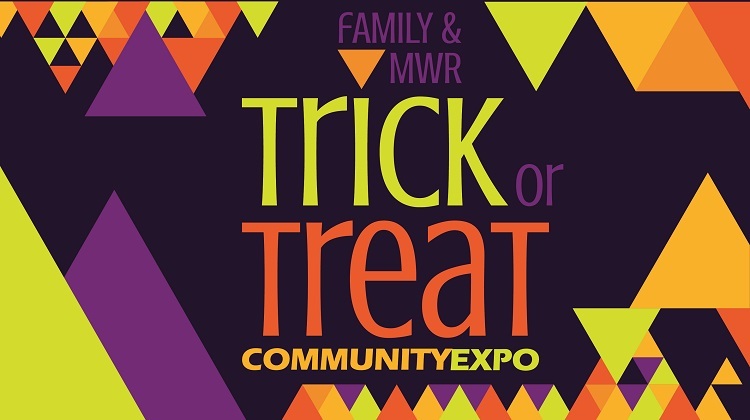 Date: Oct 11 2018, 11:30 a.m. - 1:30 p.m.
Family & MWR invites you to trick-or-treat your way through our Community Expo! Speak with representatives from throughout the community, learn about Family & MWR services and programs, meet new friends and become acquainted with your local area. Program and vendors will distrubute candy and other giveaways to both adults and non-school-aged children. Those who attend will also have the chance to win a $1,000 gift certificate for European travel through Army Outdoor Recreation, along with over a dozen other prizes. In order to win, participants must attend the Expo and complete the passport entry form by visiting all the designated exhibitors. All passport entries must be submitted on site at the Expo prior to 1:30 p.m. the day of the Expo. The winners will be announced on the Rheinland-Pfalz Family & MWR Facebook page and notified within one week following the event. Submissions that do not follow all guidelines will not be eligible to win. Must be a U.S. ID cardholder to participate. Each U.S. ID cardholder may only complete one passport entry form per expo event. Family & MWR employees and their Family members are not eligible to win the grand prize. Family & MWR Marketing employees, the chain of command and their Family members are not eligible to win any prizes. Must be 18 years of age or older to claim prize.